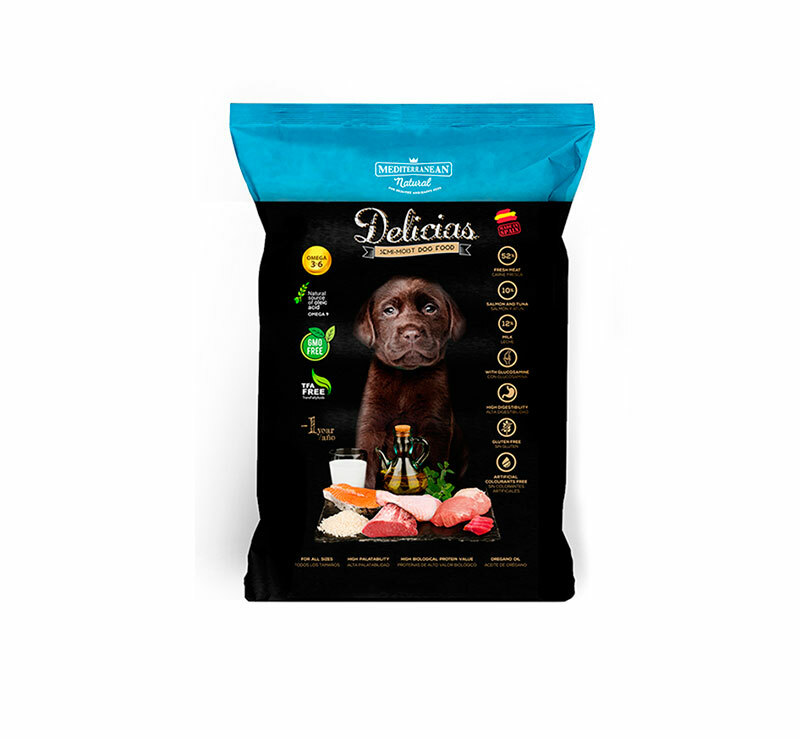 Mediterranean natural | Delicias of Mediterranean Natural: Semi-moist food for dogs. Gluten free and colourants free. With glucosamine. 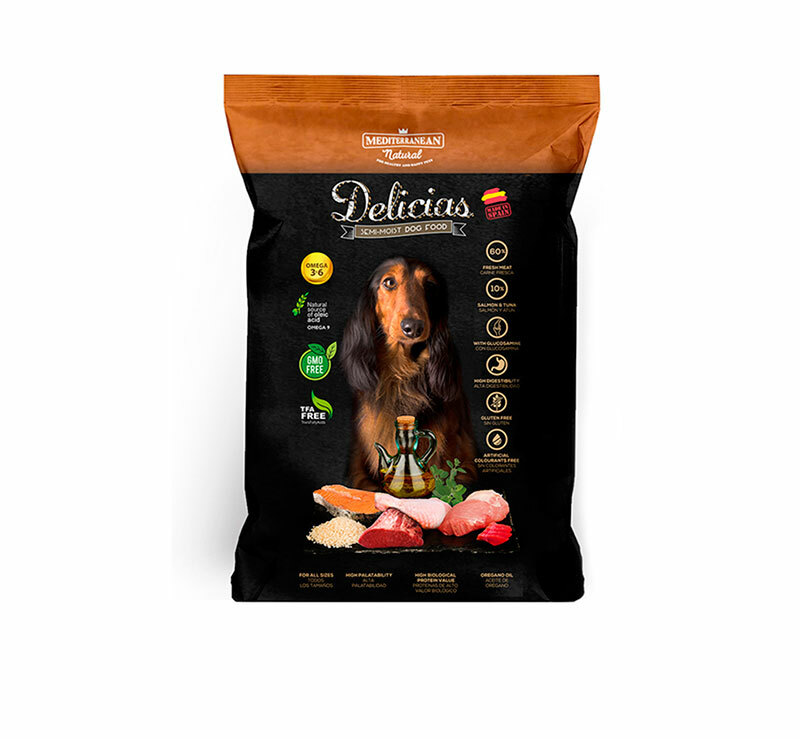 The semi-moist dog food for adult dogs is specially developed for small and medium breeds and those dogs with difficulties to eat dry food. 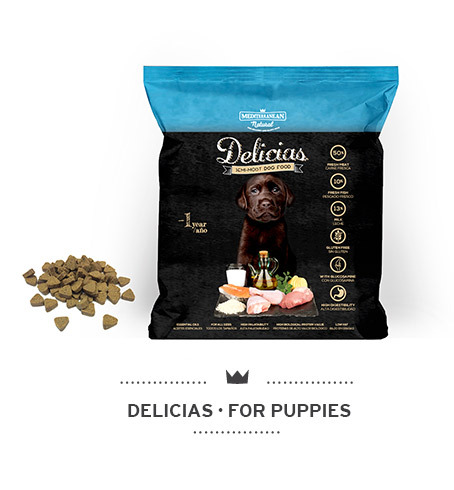 It is made with 60% of fresh meat (chicken, serrano ham, pork liver, lamb and beef) and 10% of salmon and tuna. 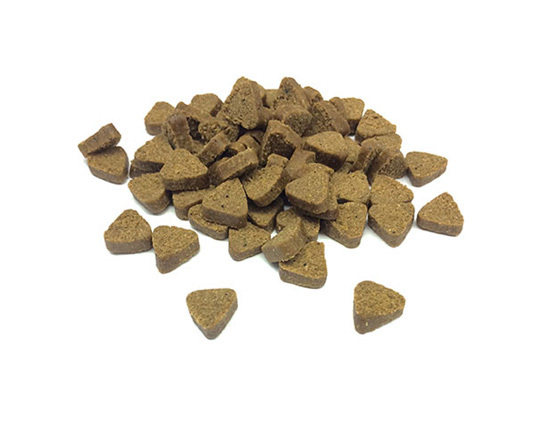 The semi-moist dog food for puppies is specially developed for puppies under 1 year. 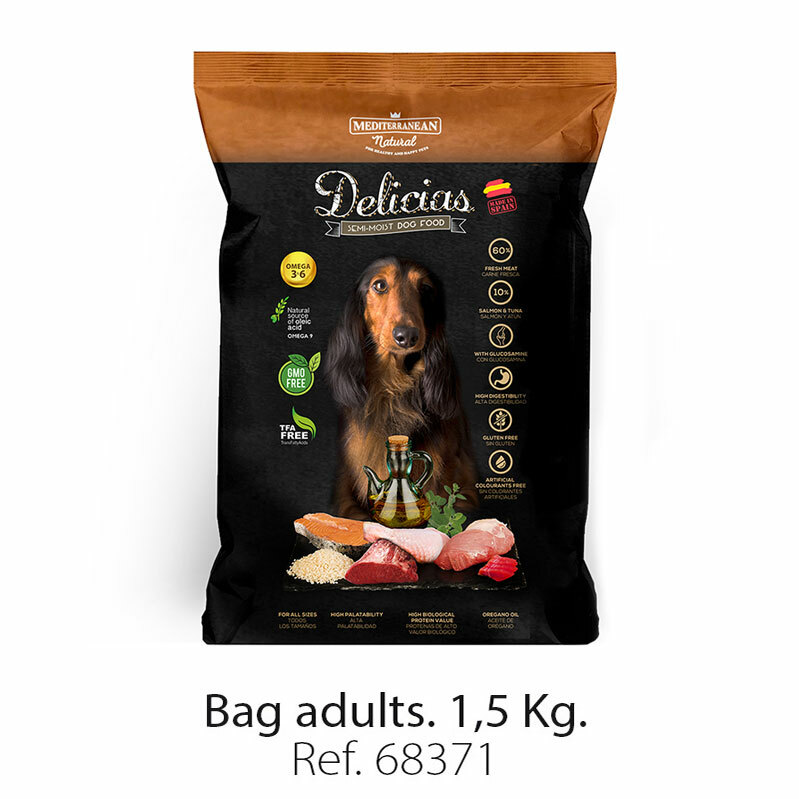 It is made with 52% of fresh meat (chicken, serrano ham, pork liver, lamb and beef), 12% of milk, 10% of salmon and tuna. 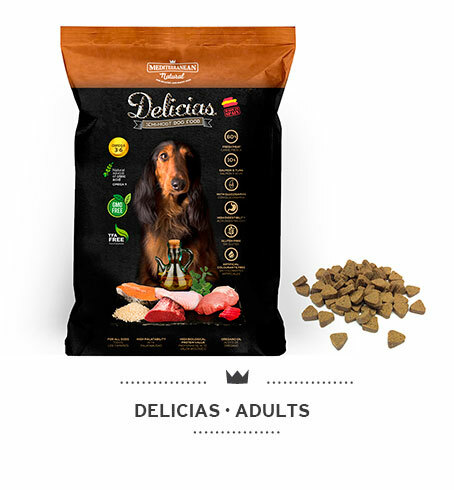 Delicias semi-moist dog food contain crab extract and prawn extract (source of glucosamine) to promote the development of cartilaginous tissues. Airtight seal. It is a GMO free and trans fatty acids free product, rich in Omega 3 and 6 and natural source of oleic acid. Fresh meat 60% (chicken meat, Serrano ham, pork liver, beef meat, lamb meat), salmon and tuna ﬁ sh (min. 10%), vegetal glycerin, cereals (rice min. 9%), crab extract, prawn extract. Additives: propionic acid, potassium sorbate. Antioxidants: citric acid, or egano oil. Vitamin A 21000 ui, Vitamin D3 1840 ui, Vitamin E 17 ui. Protein: 23.8%, fat content: 10.2%, crude ash: 13.4%, ﬁbre: 0.78%, moisture: 10.9%, 351 Kcal/100g, glucosamine: 25mg/kg, calcium 3.3g/100g, phosphorous 1. 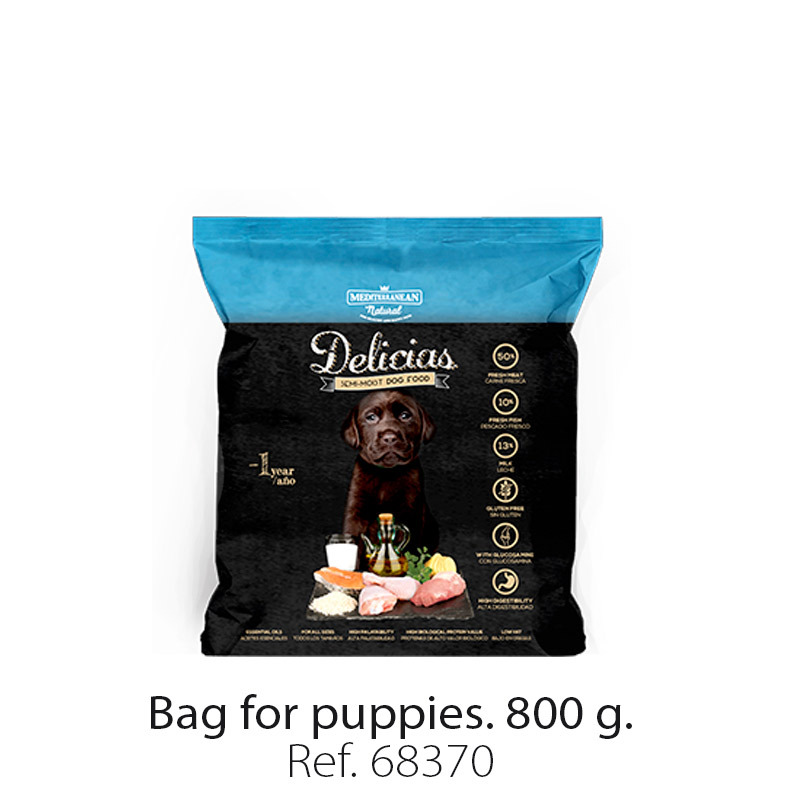 9g/100g, sodium 1.1g/ 100g, magnesium 0.25g/100g, iron 0.02g/100g, zinc 0.05mg/kg, coper 0.02mg/kg, omega3 0.33g/100g, omega6 1. 7g/100g, omega9 (oleic acid) 4.04g/100g. Fresh meat 52% (chicken meat, Serrano ham, pork liver, beef meat, lamb meat), powdered milk (min. 12%), salmon and tuna ﬁsh (min. 10%), vegetal glycerin, cereals (rice min. 8%), crab extract, prawn extract. Additives: propionic acid, potassium sorba-te. Antioxidants: citric acid, oregano oil. Vitamin A 22000 ui, Vitamin D3 1900 ui, Vitamin E 44 ui.